Starting my beauty week with the first building block of skincare - cleansing - and my favourite mode of cleansing - hot cloth. I've tried them all, cream, liquid, foaming, wipes and micellar waters, but I always go back to hot cloth cleansing. It's the only one that makes my skin feel completely clean and refreshed. Over the past couple of years, I've tried many different hot cloth cleansers so I wanted to share with you on this post, the ones I use most frequently. I'm not featuring Liz Earle's Cleanse & Polish for two reasons. Firstly, I'm not a huge fan and secondly the company use parabens in too many of their other products and therefore I feel their 'natural' strap line is a little misleading. There's an interesting blog post about this here if you'd like to read more. So if you are a Liz Earle fan, I urge you to try my first option. It's far superior from an ingredients perspective and actually works out less expensive too. The texture is not unlike Cleanse & Polish but it smells divine and the accompanying facecloth is a lovely texture. A couple of pumps is plenty for normal make-up removal and the ingredients are completely natural. I use this to take face paints etc off the kids skin too...it's so gentle. You only need a tiny amount of this so it does last well. It comes with a plastic spatula to prevent any bacteria getting into the tub from your hands. It has got tiny exfoliating beads in it that burst while you're using it - so there's a slight scrub effect from it. Very minimal though so it's fine for daily use. 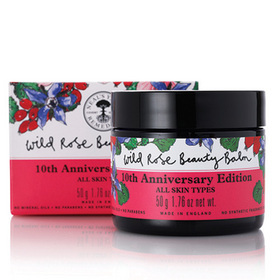 A complete treat for rose lovers, this is more than a cleanser - it's a destressing treatment! It can be used to cleanse with a flannel as per the other products but it's also amazing for sore skin, dry patches and with the rose extracts, it's particularly good for skin with rosacea. I have a few samples at home so drop me a line if you'd like to try it. I am a (very unproductive) NYR consultant - I just don't have time for it at the moment but I still do orders a few times a year for my regular customers. It's not got the grittiness of the Neal's Yard and Temple Spa so it's not my favourite for that reason - it definitely feels oilier to use. But it does the job and also doubles up nicely as a dry skin rescue cream. No cloth included in this one (the others all come with a muslin or flannel). 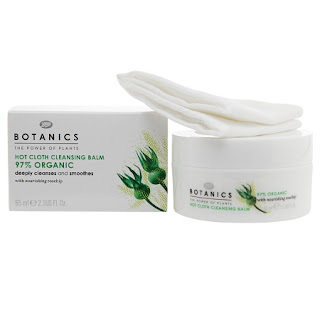 And the final one I've road-tested and can recommend is the Boots Botanics Cleansing Balm, which I've mentioned before on the blog a couple of times. It's on offer at the moment too! I use this one lots when I'm having a leaner month and the only thing I don't like about it is the smell. Personal choice there - it does the job at the end of the day! There are tons of other options and the best bit about the oil balm textured products is that they are all paraben free (parabens are only used in creamy cleansers). Lisa Eldridge has a nice video featuring some of them on this link if you'd like to find out more - zip forward about 2 minutes 30 to get to the nitty gritty. So I'm back tomorrow with the next stage of my skincare routine to include my foaming cleanser of choice and the anti-ageing creams I use daily. Hi Avril. As a regular (but not entirely satisfied) cleanse and polish user and rosacea sufferer, I d be interested in trying the NYR balm..thanks, Katie. Hi, I'm in the market for a new cleanser, I've been using Antonia Burrell but not sure how effective it is and it may just be me falling for a gorgeous smell. I like the look of In The Beginning melt - I wonder if it does the trick on hormonal type outbreaks? Great post Avril - I actually had the Liz Earle one on my Xmas list! I tried a sample and like it but currently using a cheap Superdrug one that I read was good. It's ok but doesn't feel like the Liz Earle one. 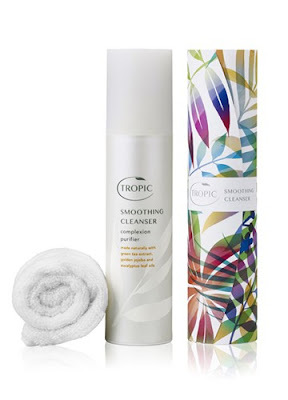 I am going to swap to the Tropic one above now - thank you! I also didn't realise the NY balm could be used with a cloth. I wen to a NY party last year and we all loved it but as a balm not a cleaner. Will pass this post on to a mate who bought it. I would like to try the NY balm. Can a sample be sent to the U.S.? If so, please let me know and I'll give you my postal address. Thanks!